Percival De Luce lived in New York City. He is known for his genre and still life paintings. He studied at the Antwerp Academy, Brussels, with Portaels and with Bonnat in Paris. He was elected an Associate member of the National Academy of Design. He was also a member of the American Watercolor Society, Salmagundi Club, and the American Fund Society. He exhibited at the National Academy of Design, Brooklyn Art Assoc., Pennsylvania Academy of the Fine Arts, Boston Art Club and Art Institute of Chicago. 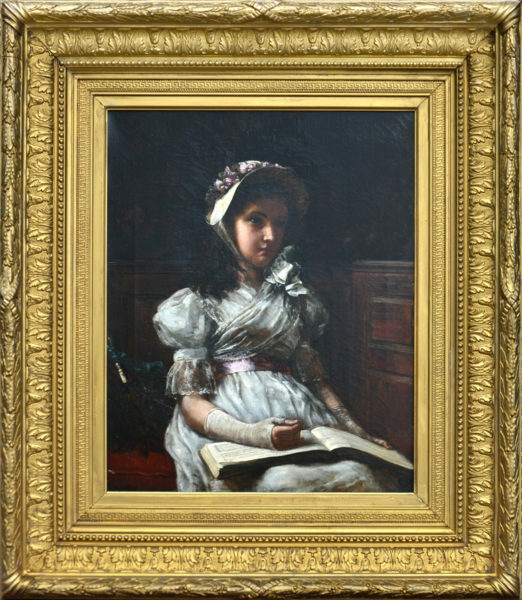 Comments This painting is in excellent condition in a period fine carved gold frame also in excellent condition.